Back to basics, returning to the best. I now own three complete sets of cookware. First is a conglomeration of non stick pots and pans. Second is my cherished Tramontina Stainless Steel cookware and third… is the holy grail of all cookware, my mixed set of Cast Iron. The first two I could live without, the third I couldn’t. I called it a mixed set, here’s why. I show little allegiance to name brand. In fact, most of my cookware is so old that if it ever had a name, I’m sure by now the company is long out of business. Many of them are well over 100 years old. The reason I chose each one individually is due to the quality. Even new pots and pans have flaws in them. They may not show but if you look closely at the rim and see a slight difference in thickness, this is a flaw. It will not heat evenly. Now other metallic pans are stamped out or extruded or as in cast aluminum, made with steel dies that cannot deviate in size. They are theoretically perfect. Cast iron pots and pans are made using a method ages old called sand casting. A box of oily black sand is used to make the pans impression in. Top and bottom. They put the two halves together, then molten cast iron is poured into the cast box. Once the impression is filled, the box is broken in two and the sand, along with the freshly cast pan, is poured out. The sand is recovered and reused. The pot is then inspected for flaws of any sort and sent for further finishing. A reputable cast iron cookware company has much higher standards of quality than most imports. Those I stay away from, no matter the brand. Another I don’t cotton to are ones with an enamel finish. What’s the point of these? You’ll never obtain the taste of true cast iron cooking with enamel cookware. So how do you know if a pans any good to buy? In this rare case, name brand does help. Be aware of specialty pans made for famous chefs or merchants. They are usually a cheap import or lesser quality line made by someone else. Think about this, what qualifications do Emeril, Paula Deen or any other celebrity chef have that qualifies them to have their name cast in cookware? None! So don’t get roped into buying some junk cookware because some celebrity stuck their name on it. 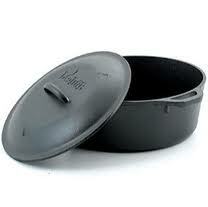 I have seen some horrible import cookware on the market with great looking packaging. Remember, you will not be using the beautiful looking packaging to cook with. Some I’d stay away from are. Bayou Classics (cheap import), Stansport ( Chinese import, casting marks and handles are questionable but the dutch oven seems good), Buffalo tools (Import, cheaply made) Most any famous chef brand and unfortunately even Cracker barrel. This is because they cast their name on the bottom causing uneven heating. Things to know about cast iron cooking and care. 1- Quality. Scaling is NOT normal. A properly cast and finished pan will not scale if pre seasoned correctly. Look for how well ground out the mold marks are. See if the lid fits snugly and look for thin spots on the rim. Don’t overlook the handle, it should be smooth, even in the hanger hole. 2- Pre seasoning. Cast iron is the original non stick cookware. Once it is seasoned, nothing sticks to it. Follow the manufacturer’s directions if purchased new. Many are now being sold as “pre seasoned”, that’s all fine and good for the first time cooking, but continue to season the pan as if it were not pre seasoned. To season; Wash pan in mild dish detergent and dry completely. Pre heat your oven to 225 degrees. Then using lard, shortening or the least desired vegitable oil, lightly coat the entire pot, inside and out. Place the pot in the heated oven for 15 minutes. After 15 minutes, increase the oven temp to 500 degrees and bake for 45 minutes. Remove when finished and allow it to cool. When cool, the pot should not be sticky, if it is then either too much oil was used or time and temp were too low. Reheating at 500 degrees for another ½ hour should solve the problem. If the pot is an antique or rusty, clean it very well, even using steel wool and a mild detergent, then season twice in a row. 3- Cleaning. Never, ever, place cast iron in the dishwasher to be cleaned. Only a mild quick cleaning followed by an immediate drying is ever needed. I know of many cooks that simply wipe out the pot with a damp towel then returned to the fire for 1 minute to dry. Re-season by simply wiping a fine layer oil on it. If heavy cleaning is needed then you should re-season it using the oven method. The secret to forming the non stick surface is to allow a build up on the interior of the pot or pan. By wiping with a damp towel and drying it afterward using heat, will begin the buildup. Some of my frying pans, to my best judgment, have never had anything done to them but a good wiping out. I said before, some of my cast iron cookware is over 100 years old! If scrubbing is needed, use a mild detergent and a nylon scrub brush, never metal chore boys or Brillo type pads. If you cook outdoors, you can simply heat the pan until the stuck residue burns into a char. Then just wipe out the char using the damp towel again. Cast iron can crack or warp so never place a hot pot or pan in cold water, let it cool first. 4- Cooking tips. Before using, wipe a teaspoon of oil into the pan before pre heating. Then pre heat to warm it up before placing food in them. Never place frozen or very chilled food into cast iron, doing so will cause the food to stick and burn. Soups and watery foods do not require a preheated pot but still wipe a bit of oil in them first. 5- About Dutch ovens and frying pans. When looking at frying pans, any over 12” should have an opposing handle of sorts opposite the long handle. It may be just a 1” cast nub or a formed loop handle, either works since you’ll never grab cast iron bare handed anyway. Use a lid lifter or pot holder in removing the lid. I am against using the leather gloves so many trail cooks use because leather will hold and transmit heat, causing severe burns. I opt for a heavy cotton or Kevlar cooking glove. 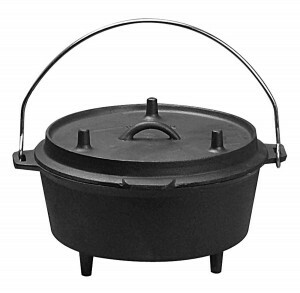 Dutch ovens come in two styles, flat bottomed or with legs. Flat bottoms are made for stove top or oven cooking. 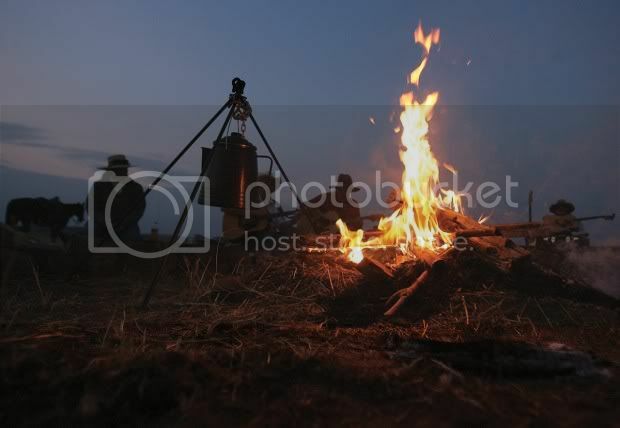 They can be used over a campfire if they are fitted with the wire hanger handle and work well on electric stove tops.The lids fit as either a normal pot lid or come in the depressed lid style, either works well. Dutch ovens with legs are made for open fire cooking only and will not work on electric stove tops. To use, place the pot directly on top of a bed of coals, then heap coals on the lid, doing so acts to completely submerge the pot in heat. The lid has a depression made in for this purpose. Cooking with cast iron sounds like a bit more work, but what you put into cooking is what you get back out. 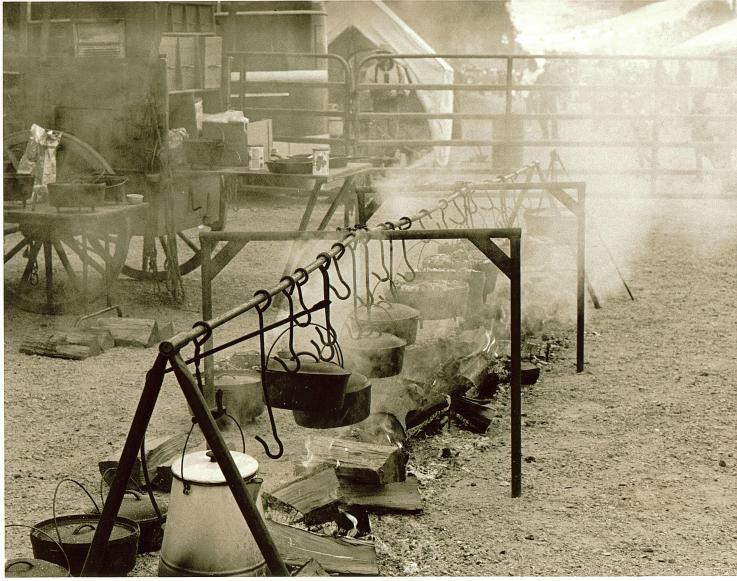 Some of my 100 year old pots and pans are still releasing flavor from cooks long gone up to the big Chuck wagon in the sky. Cast iron cookware rarely if ever changes and are for the most part, passed down from generation to generation. While I do own other cookware, those will most likely never hang from my children’s pot racks, they’ll be sent off to Goodwill. My eldest son has already laid claim though to my cast iron cookware when I too start cooking at the Heavenly Chuck wagon.